High Resolution: Yes; Widget Ready: Yes; Compatible Browsers: IE11, Firefox, Safari, Opera, Chrome, Edge; Compatible With: WPML, WooCommerce 3.1.x, WooCommerce 3.0.x, Visual Composer 5.1.x, Foundation 6; Software Version: WordPress 4.8.x, WordPress 4.7.x; ThemeForest Files Included: PHP Files, HTML Files, CSS Files, JS Files; Columns: 2; Documentation: Well Documented; Layout: Responsive. Ayame WP theme has incredible functionality and versatility with an abundance of customization options. A true ecommerce WordPress theme Ayame will provide your customers with a modern, elegant and fast website, without giving you the headaches involved with advanced coding. 5 Minutes Theme Setup ЁC install demo content, with all settings, widgets and everything, exactly as in online theme demo, with minimum time and effort. Only follow "Next" buttons steps, without any additional setting up, plugin installations. Go from there and customize your site using Elementor ЁC fast and intuitive front end page builder. Ayame is easy to install with multiple page layouts pre-populated for you to update, is simple to maintain and has been developed with best practice WordPress philosophy. Ayame completely embraces native Theme Customizer . This means ЁC no confusing extra panel options built in, Ayame does it all using only Theme Customizer = simpler for the end user. With a little help from KIRKI TOOLKIT and designed from the ground up with WooCommerce in front of mind, Ayame greatly extends WordPress' capabilities. Ayame is bundled with couple of GREAT plugins as well as Micemade custom "Micemade Elements" ( Elementor addon ), "Micemade SO Widgets", further enhancing the capabilities of what you can achieve with WordPress at no extra cost to you! All of this bundled together makes Ayame extremely powerful for eCommerce websites that want total control over everything; product layout display options, product elements for Visual Composer, customized checkout pages, support for Wishlist plugin, custom Quick View and much more! Elements in "Micemade Elements" plugin. Item support for Ayame includes. Does not include customisation or installation service. Beautify - WooCommerce Theme for Creative eCommerce; Larix - Creative Multipurpose WP theme; Sequoia - E-Commerce and Multipurpose WP Theme; Kauri - responsive theme for WooCommerce. Keywords: customizer, e-commerce, elementor, fast loading, florist, flowers shop, gardening, mobile, optimized, page builder, responsive, shop, woocommerce, wordpress theme. Premium ThemeForest Ayame WordPress and WooCommerce Theme for Florist and Gardening Shops 20765777 WordPress Themes, Website Templates, Mobile Themes, Flash Templates & Scripts from creative professional designers. Full details of ThemeForest Ayame WordPress and WooCommerce Theme for Florist and Gardening Shops 20765777 for digital design and education. 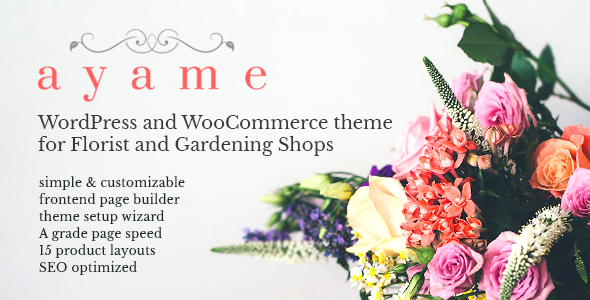 ThemeForest Ayame WordPress and WooCommerce Theme for Florist and Gardening Shops 20765777 desigen style information or anything related.